New white jersey winner Nairo Quintana’s attack set a marker, Froome took control when it mattered. Result: CHRIS FROOME WON the stage in dominant fashion and so took a hold of the General Classification lead after powering through stage eight in the third fastest fastest time ever up Ax-trois-Domaines. How it happened: Froome launched a solo attack 4km from the race’s first summit finish and crossed the finish line 51sec ahead of Australian teammate Richie Porte to underline his overall victory credentials. Colombian Nairo Quintana (Movistar) had launched the first serious attack up the ascent and he looked to be going strong despite some distracting roadside support. After descending the first climb though, Froome and the Peloton caught up with five kilometers to go. And as Alberto Contador struggled, Sky’s new leading man launched his attack. Moving up the mountain so smoothly, nobody could match him from there. The big winner: Undoubtedly it is Froome and Sky who wrestle control of the race lead into their hands and put themselves into a dominant position for the overall prize. The big loser: Contador, the Spaniard finished 1:51 off the pace and never looked able to match the attacks out front. He even earned telling off from team-mate Roman Kreuzinger as things began to turn sour. Who is wearing what jersey? Dan Martin moves up to 13th for Garmin-Sharp after finishing 15th on the stage. However, Nicolas Roche slips from ninth to 22nd. Tomorrow the Grand Tour takes us from Saint-Girons to Bagnieres-de-Bigorre, a relatively short stage at 165km, but one with five steep climbs before 30km descent which is sure to make for a lightning quick finish. Lego Andy Murray with a beard. What are they smoking up in Scotland? Email “Sprint Finish: Froome takes yellow back to Team Sky”. 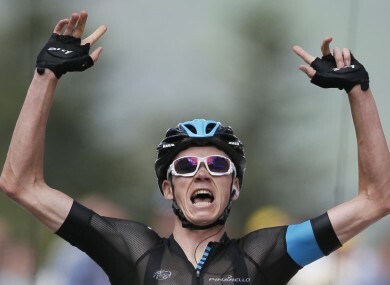 Feedback on “Sprint Finish: Froome takes yellow back to Team Sky”.